I was really quite excited for the first round of the FNSS – its a great series, grassroots to the core. Having never raced at Borough Hill, I wasn’t too sure what to expect either. I left school at half three so I could have some food plenty of time before the race was due to start (roasted Mediterranean veg, chicken wrapped with Parma ham and beef meatballs in tomato sauce at the local Pesto restaurant) before I then drove down to Daventry. Having got there with plenty of time in hand, I did two laps as warm up, one slower to scope the course (LOADS of nettles everywhere!) and then a faster one with a few efforts to get the legs warm. The course was pretty good, there was a long descent through the woods into a short road climb, a heave over a very rutty grass climb, a drop down alongside a meadow into the woods (plenty of roots) before climbing back up onto a gravel path ready to hammer back to the start. After 40 minutes of warm ups, it was then more or less time to head over to the start. I raced with a Caffeine Huma gel on the start line and then Green Tea Skratch in the bottle which worked really well for a 50 minute race (Strava file). My goal for the race was to keep with Oli Bell – a very good up and coming Youth rider, which I managed until he attacked on the only road climb of the lap towards the end of the race. He managed to open a 100m gap which I just wasn’t quite able to close down! 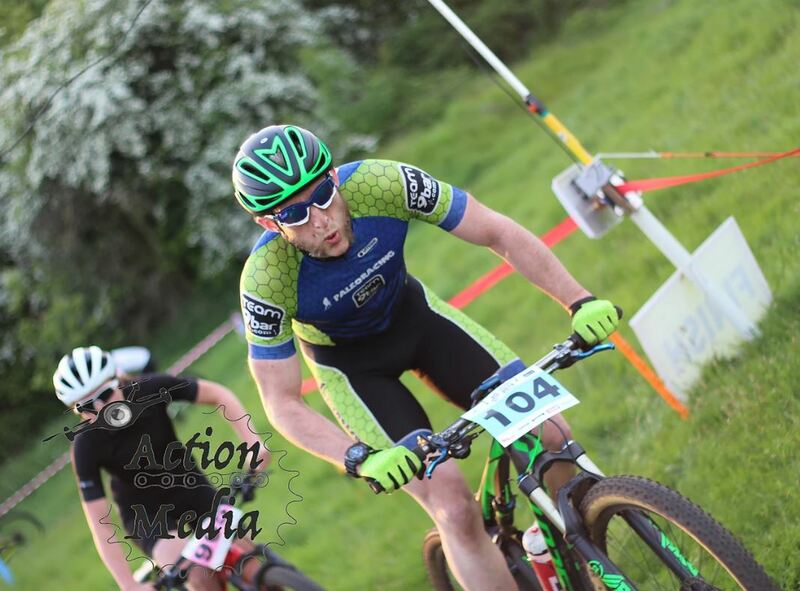 I crossed the line in a respectable 9th, which I was happy enough with considering my form hasn’t been great this year after crashing at Sherwood. I spent Saturday ferrying my daughter to and from events and then drinking Pimms in the garden – not the greatest of preparation for Sunday(!) but it was always going to be a training race regardless. I picked up Nathan on Sunday morning after a short paddle in my new kayak in the river and headed over to Cannock. The course looked fun, loads of good singletrack (one of my strengths) and only one really long gravelly climb (one of my weaknesses). My plan for the race was going to be to really work hard to recover in the singletrack, ride the long climb at just over threshold and not push myself too hard. I knew I’d be starting from the back row, so as long as I kept myself steady in the heat I should do OK. Nathan offered to bottle for me which turned out to be a godsend in the heat! My main goal for this was to try and ride consistently, putting out the same power and time for each lap. Due to the heat I knew if I went off too hard I’d really be paying for it later on, and looking at the power file after the race I managed to be super consistent. I had a spread of lap times of just 4.4%, so I was extremely pleased with that. I managed to ride well for how I felt, and finished in a decent enough 13th place. Onwards and upwards! The Roots and Rain link is available here and the Strava file here.